Location: Surrounded by 10,000 replanted ancient camphor trees and bordering Qizhong Forest Park in the Minhang district of greater Shanghai, Amanyangyun lies about 1,5 hours out of the city of Shanghai. The location makes it less favourable to tourists and more a retreat escape for local Shanghai residents. 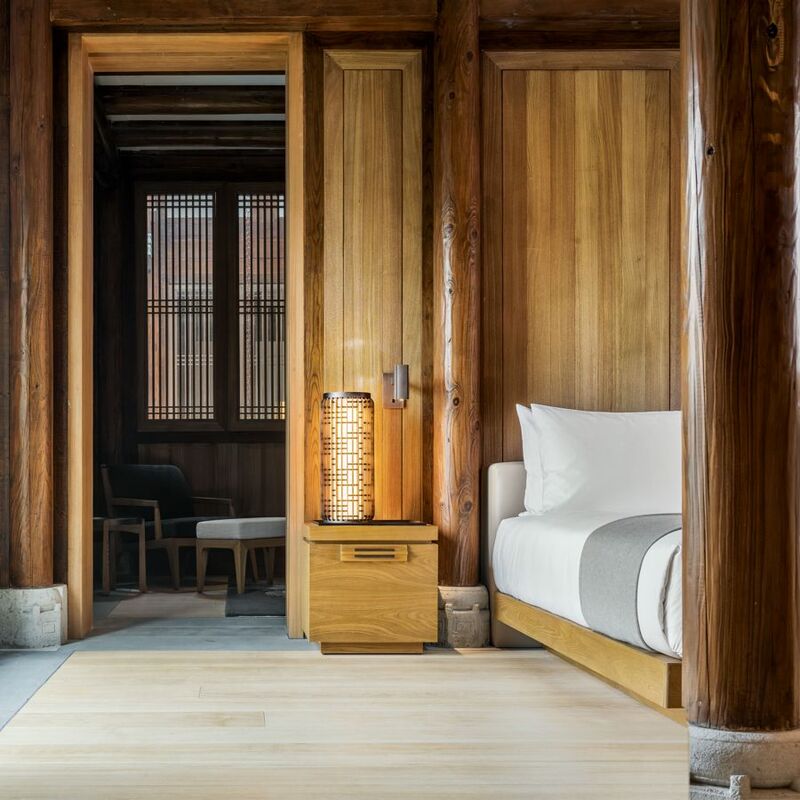 Style: Kerry Hill has designed a resort that includes outstanding preservation and restoration of ancient Chinese buildings mixed with signature modern design. The resort boasts an extraordinary story and Chinese heritage underlies Amanyangyun, moulding its character. The ancient villas and huge camphor tree were originally situated in Fuzhou in the Jiangzi Province, but the imminent building of a dam meant total destruction. Local entrepreneur Ma Dadong set about preserving them, which involved moving them piece by piece over 434 miles, to be reassembled 15 years later as the heart of the resort. Kerry Hill Architects has drawn on the design of these Ming and Qing dynasty villas skilfully blending typical Aman minimalism into the mix alongside the historic structures . The result is very impressive; offering a glimpse of a China of yesteryear, whilst inserting every luxury of the 21st century. Rooms: The resort is less hotel and more luxe living. The four bedroom residences boast lap pools, underground yet light filled art galleries and an uber-cool bank vault. The 24 suites each come with courtyards, rooms to serve tea and oversized rain showers and bath tubs. The grey stone aesthetic is accented with light wood lattice and mute-toned artworks. Food: Surprisingly, the food at the resort, given it's remote location is outstanding. Breakfast is a lavish spread, including fresh house-made french-style buttery, flaky pastries, eggs to order (poached are perfection) and healthy sides such as avocado. There are three restaurants on site including Arva, an Italian dining room that serves up authentic wood-fired pizza and house-made pasta with toppings such as fresh truffle. There's also Nama which offers a modern Japanese menu and Lazu, a classic Chinese restaurant serving up dishes from the Jiangzi region where the antique villas and camphor trees originally lived. Try the juicy ‘xiao long bao’ dumplings or poached chicken with ginger and spring onion dressing - simple and moorish. Drink: There is an excellent wine list, including a Chinese selection and a classic cocktail menu should you wish for a quiet tipple. Spa: This is where the hotel really excels. Upon entering a large spa lounge, you're met with tea and healthy snacks. The spa-centre surrounds an elegant courtyard and boasts the largest amount of treatment rooms in Shanghai. It also counts a yoga studio and a pilates studio amongst it's offerings, making the resort ideal for high-end conferences. A signature massage treatment starts with a foot bathing ritual, before choosing a custom essential oil. Post-massage you're led to your own private lounge that overlooks the garden. Make time for a session in the Russian Banya. Culture: For those wanting to immerse themselves in Chinese culture, the resort's Nangshufang centre offers programs where you can master the ancient art of a tea ceremony, calligraphy, incense making and art. CHILDREN: There are multiple cultural activities and the residences make it ideal for families. In Bed With was a guest of Aman Resorts.